In terms of the calibre of non-international competitive basketball, the Euroleague is second in the world only to the NBA. That is to say, of all the leagues in the world not to excessively overuse snippets of Busta Rhymes songs, or turn nightly to the tortured genius of Kiss Cam, the Euroleague is the best. If you love basketball, you’ll love watching the Euroleague. If you love basketball and yet have never watched the Euroleague, you haven’t tried hard enough. The first two group stages have been complete, and now the eight strongest teams enter a playoff-style format or head-to-head series. Ergo, continuing a series of posts that take fleeting glances at every worthwhile current player in the world today – the loose theme of which is ‘Why spend all that time watching it all just to never write about any of it?’ – there follows a look at the compelling protagonists of the final eight teams in this Euroleague season. Teams list in no order other than alphabetical. Juan Carlos’s time in Memphis wasn’t all this happy. As ever, Barcelona are absolutely stacked. They have three options at every position, populated almost exclusively with players who will be, who were, who could be, or who could have been, NBA players. To put that into some context, they have seven former NBA draft picks on the team, and two more players who played in it as undrafted free agents. That list doesn’t even include Jaka Lakovic, a high quality European guard, or Joe Ingles, a man who almost got drafted as recently as 18 months ago. There’s just reams of talent at every position, and the talent assault is relentless. The starting backcourt consistently consists of Ricky Rubio and Juan Carlos Navarro. Navarro has lost nothing; his assault of jumpshots and floaters still reigns supreme, and is still good for 14.8 points per game in only 26 minutes per contest, on 46% shooting. Rubio, though, seems to be suffering from stagnated growth. The improvements shown last season in his feet-set jumpshooting have completely disappeared, and for the season he is shooting 19 of 92 from three point range across Euroleague and ACB play. He is, amazingly, still only 20 years of age, the most experienced 20 year old in the basketball world, the only 20 year old point guard to have been a key component on both a Eurobasket and Euroleague champion in the past 18 months. And he’s still very good. The transition, the passing vision, the defense on point guards, and the pick-and-roll assault, are in as full of a force as always. But he’s more Brevin Knight than Steve Nash at this point, and will be until such time that he can consistently make open shots. It looked as though his jumper was getting there, but he’s regressed at what was already his biggest weakness, and it’s a concern. Once he’s fixed that leaky dam, he can begin working on creating his own shot and shooting off the dribble. The frontcourt is no shallower. Fran Vazquez, Boniface N’Dong and Erazem Lorbek all returned this season, and added to the bunch was Kosta Perovic, who transferred in from Valencia. Between the four, Barcelona can offer every kind of look. Vazquez and N’Dong are the big and athletic interior defenders; Perovic is even bigger than them both, whose size alone can serve as a deterrent. On offense, N’Dong and Vazquez can run the court, as well as the pick and roll, and make their mid-range jumpshots. Perovic can create around the basket and has footwork and touch, if not much speed or strength. Lorbek can do both; he can create in the post, step out for the mid range jumpshot, and drive on slower opposing bigs, armed with the best mid-range game of the four. And if Barcelona need a small ball four, they can turn to Terence Morris. Morris has started at small forward for most of the season after Pete Mickeal was ruled out for the season with a pulmonary embolism. He brings the ability to spread the floor and defend opposing perimeter-based forwards, as he usually has more athleticism than they do, which also allows him to drive on them. To back him up, and further offsetting the loss of Mickeal, Barca picked up Joe Ingles at midseason from ACB strugglers CB Granada. And while he hasn’t played well in the Euroleague yet, Ingles has done in ACB play. He’s hit his shots, played mostly mistake-free, defended the perimeter, moved the ball, and even hit a game winner at one point. Rather than starring for a bad team, he’s now a useful role player for an elite one. And that’s surely better for all concerned. Except CB Granada. Barcelona are the defending Euroleague champions. They are balanced, they are versatile, they are experienced, and they are freaking stacked. It is therefore inevitably hard to bet against them. In these quarter finals, Barca are matched up against Panathinaikos, the Euroleague champions of two years ago, and who are almost equally freaking stacked. It’s a series Pana absolutely can win, and it’s definitely a series more suited to the finals than the quarter finals. Barcelona are not infallible, Rubio has regressed, and the absence of Mickeal is a big one, But I’m not picking the upset. Mirza Teletovic and Pau Ribas. Whoever chose to make this picture black and white, they did not help aaaaanybody. Over the summer, Caja Laboral lost rather a lot. Tiago Splitter went to the NBA, Lior Eliyahu returned to Israel (more on him in a minute). Carl English moved to DKV Joventut, Milt Palacio went to Greece, and Walter Herrmann negotiated his way out of his contract in order to attempt a return to the NBA. (He has since gone unsigned altogether.) They also lost Vladimir Golubovic, although this wasn’t as much of a loss. Initially, they didn’t have much luck replacing them. They had success when they replaced English with David Logan, but didn’t do so well elsewhere. They tried to replace the Eliyahu/Golubovic combination with Florent Pietrus and Pops Mensah-Bonsu, but neither lasted long; Pietrus only signed a one month contract and soon left, and they vetoed the Pops signing when they found scar tissue in his knee (which has been there forever and not held him back; they just didn’t do their research on this one). They replaced Pops with Marcus Haislip, but he struggled, got cut, and went to China. They brought in Nemanja Bjelica, who the Timberwolves just drafted, but he has not played much. And they never got another backup point guard. Caja Laboral thus entered the season slightly undermanned. They also didn’t get another centre, initially. However, after they replaced Haislip with Pape Sow, they were also able to sign Esteban Batista from fellow Spaniards Fuenlebrada. The duo have now been handling the backup big man minutes for much of the season, in their very different ways; Batista, averaging 7.3 points and 6.2 rebounds in Euroleague play, does it with strength, whereas Sow, averaging 3.3/3.2 with 2.7 fouls per game, does it with athleticism. The centre hole had been filled. The backcourt is headed up by Logan and Brazilian national team main stay Marcelinho Huertas. The book on Huertas is well written by now; he will run 146 pick-and-roll sets on you in a game, and there’s not an awful lot you can do about it. Huertas leads the ACB in assists with 5.9 a game, and his 5.5 in Euroleague play rank second only to Dimitris Diamantidis of Panathinaikos – this is all the more impressive when you consider that his main pick-and-roll option, Tiago Splitter, now backs up DeJuan Blair and Antonio McDyess. Alongside him, Logan plays the role of the scorer, the athletic undersized scoring guard who can get to the rim, finish, score in isolation, and hit jumpshots off the dribble, as well as off of curls. Additionally, with the early onset of male pattern baldness now impossible to conceal, Logan no longer feels he should wear his headband at an angle so steep that it was almost vertical. Nobody sweats at that angle, and we weren’t fooled. As hinted at above, there is no pure point guard behind Huertas. The role is often defaulted to 24 year old Spaniard Pau Ribas (whose unused maternal surname is the unfortunate “Tossas”), yet he’s not a playmaking point guard. He defends the position and shoots the three, but that’s about the limit of his role. Brad Oleson can also be seen to take an occasional turn at it, yet he, too, is a scorer. (And a pretty bloody good one at that, although he’s scoring only 6ppg in Euroleague play this season.) There’s also no real small forward backup to incumbent starter Fernando San Emeterio, but this is not a huge problem, considering that San Emeterio plays the vast majority of every game. San Emeterio is the classic late bloomer; never much of a prospect, he was picked up by Caja Laboral in his mid-twenties, purely to provide domestic depth, yet he’s since gone on to be one of their most important players. San Emeterio is something of a point forward, a highly capable if unathletic driver who has developed the three point range to match, and whose playmaking skills allow the Ribas/Logan/Oleson trio to cover the point guard spot when Huertas is out of the game. He is the rare example of the player who breaks out after the age of 25; the hard-working, mistake-free, versatile, team-leading glue guy who ranks second on the team in points, minutes and assists, as well as third in rebounding. So it doesn’t matter too much that Bjelica is struggling. There are four Spanish teams in the Euroleague quarter finals, and, as evidenced by the current ACB standings, Caja Laboral are invariably the fourth best. It is no disgrace to say that they are not what they were, for they are still a very good team. However, they don’t have enough this year. in the back of Milan Macvan’s head is gratefully received. Maccabi retooled over the summer, and have now made it back one step further than they managed last year. Out went Alan Anderson, Andrew Wisniewski, Stephane Lasme, Maciej Lampe, D’Or Fischer, Raviv Limonad and half of David Bluthenthal’s name; in came Milan Macvan, Sofoklis Schortsanitis, Jeremy Pargo, Lior Eliyahu, Tal Burstein and Richard Hendrix. That’s a clear talent infusion, particularly in the frontcourt. Sofo, brought in from Olympiakos, is in the midst of the best season of his career. This isn’t as powerful of a statement as it might have been, given some of the wasted years he had in an Olympiakos jersey, yet it’s something. He is playing at what looks to be about 350lbs – which time has proven to be about as slim as you can ever expect from him – and is using it to be an unstoppable scorer in the paint. Sofo averages 12.3 points in only 19 minutes per game, shooting 57% from the field, getting to the line five times a game, and even hitting those free throws at a much improved 67% clip. The only thing that stops him is his own feet – a good number of his alarmingly high 2.4 turnovers per game can be attributed to travels. Macvan, brought in midseason from Serbian team Hemofarm, has slotted in as a face-up scorer off the bench, averaging 3.9 points in 8.6 minutes. He has gone from playing in the high thirties in minutes in the Eurocup, to being a 10th man in the Euroleague, but he’s a fine tenth man to have. Macvan is a smooth and fluid scorer, with good hands and great passing vision, able to score in the post, rebound, get open, drive the ball, and hit some jumpshots (albeit far too confident at this latter ability). If he gave even half of the defensive effort that he does on offense, he’d move further up the hierarchy. The primary playmakers in the backcourt and on the wings are Pargo, Doron Perkins and Chuck Eidson. Eidson has worked his way up the ladder, going from D-League benches to Euroleague starting spots via a stint as the best player on a Eurocup champion. He struggles to score at the Euroleague level more than he ever did at Lietuvos Rytas, yet his ball handling and playmaking at the wing spots open up Pargo and Perkins for scoring opportunities using their superior physical tools, with both also playing aggressive, hounding defense. All three of them are willing and capable ball handlers and passers, and the three of them combine for 11.5 assists per game, which is almost unheard of at the Euroleague level. Problematically, all three of them also lack for a pure outside shooting touch – Pargo’s 32.8% three point shooting is the best of the three, while Perkins and Eidson are both recording marks below 30% in this Euroleague season. Nonetheless, despite both this flaw and Eidson’s less than stellar defense, the backcourt consistently make plays. Domestic players fill out the bench. Tall wing player Guy Pnini brings size, energy, shooting and defensive effort, as does his veteran colleague Tal Burstein. When not injured, backup big man Yaniv Green clogs up the paint, fights hard, fouls harder, and chips in with the rebounding. Naturalised Israeli forward David Blu – formerly of USC, and formerly called Bluthental – is a jumpshooting big man option with great touch and who is always an option to get a shot away, although shooting is also about all of what he does. And Maccabi great Derrick Sharp is still with the team after an astounding fifteen seasons – now 40 years of age, Sharp is around more for his wisdom than his play, and has recorded only 11 Euroleague minutes all season. But if they ever call upon his services, he’ll know what needs to be done. After finally replacing the polarising and controversial Pini Gershon with the universally acclaimed David Blatt, plus turning over and upgrading half their roster, MTA are barely recognisable from last season. The 48 time Israeli league champions are dancing their way to a 49th unchallenged, and stand their best chance of winning the Euroleague title since 2008, when they finished runners-up. It’s not as good of a Maccabi team as has been seen in the recent past, but it’s considerably better than the one from the most recent of pasts. No team has sorely missed the presence of a single player than Montepaschi Siena has missed Bo McCalebb. Indeed, the only one who might be able to claim they miss one player that much are Partizan Belgrade, who were never able to replace McCalebb when he left them for Siena in the summer. Before injuring his toe in January, McCalebb was the unquestioned best player on the Siena team, and an uncheckable matchup for every other European side. His blistering speed, penetration ability, transition game and defensive impact were irreplaceable, and while Siena were certainly still good without him, they weren’t the potent force they were with him. However, McCalebb is now healthy enough to play again. And that’s a worry for the other seven teams. The only question is how close to 100% he now is, and whether Siena will make it far enough to give him time to get back there. In Bo’s place, Siena have been running with a makeshift point guard tandem, consisting of midseason pickup Marko Jaric and Greek combo guard Nikos Zisis. Neither is the ball handler that McCalebb was, nor close to the same level of athlete. Yet both were (or rather, are) capable ball movers and facilitators, big point guards with decent enough defense (as long as they aren’t faced against any opposing speedsters) and acceptable outside shooting. Jaric has not had an especially good year – be it due to rust from so long on NBA benches, or due to the fact he’s now 32, Jaric has been very turnover prone for Siena, and wasn’t especially effective as the anticipated stabilising ball handler and playmaker in McCalebb’s absence. Nevertheless, with Bo now back, it should no longer matter. Starting on the wings are Lithuanian veteran Rimuntas Kaukenas and Indiana State product David Moss. Both joined the team over the summer as the team completely rebuilt its wing positions due to budget cuts, and both contribute on both ends. Kaukenas has the strong mid-range game, the ability to get to the basket around curls, the finishing ability and the tough defense; Moss is the better athlete and rebounder with a purer three point stroke. Both are undersized for their position, but they’re scorers, finishers, playmakers and disruptive defenders. There is also former Spurs draft pick Malik Hairston in the mix, who missed the first part of the season with back problems, but who has ramped up production throughout the season and become a key bench contributor. Hairston contributes his usual all-around game – no one outstanding facet, but good defensive effort and versatility, some athleticism, an outside shot and post-up play, able to play a complimentary role to whichever combination of players he takes the court with. Young Italian guard Pietro Aradori also has a role to play in the backcourt as predominantly a shooting specialist, as does elder statesman Marco Carrareto, playing in much the same role. Up front, Ksistof Lavrinovic is not as good as he was, but he still has plenty to give. He retains decent athleticism for a 7 footer on the wrong side of 30, can still drive the ball, crashes the glass in his never-boxing-out way, and can effectively defend both the interior and the perimeter with his combination of size and speed. As always, he is guilty of trying to do too much, turning it over at a high rate and all-too-often resorting to a three point shot he hits at only 27%, and not being always engaged defensively. Yet his inside-outside production remains, and is complimented nicely by Magic draftee Milovan Rakovic. Rakovic was always rugged, but he’s put on even more muscle, and is now what can only be described as freaking enormous. He is agile for that size, too, and a versatile offensive player, hitting mid-range jumpshots, running the pick-and-roll, and creating in the post, all with a graceful fluidity of motion and imposingly scary size. He also defends the pick-and-roll better than most big men, particularly those that big. So does Shaun Stonerook, who is now into his sixth season with the team, and one of its defensive leaders. Unless it’s a wide open layup or an open three from the wings, Stonerook never shoots. Instead, he’s in there to offer similar defensive versatility to Lavrinovic and Rakovic, while being better than both. Stonerook can guard any 3’s, 4’s or 5’s, is a good passer and rebounder, and gambles judiciously for big steals numbers. His defensive aggression and versatility drives the team, although it’s not without the consequence of hefty foul rates. Behind them, 7’1 journeyman Deji Akindele was brought in as injury cover, and survives to this day as a little-used shotblocker and rebounder. Domestic player Andrea Michelori is an undersized offensive rebounding and interior finishing specialist, while former Texas A&M big man Tomas Ress contributes the occasional jumpshot and blocked shot, if not much else. Siena have steamrolled the Italian league over the last few seasons, and were able to retool and stay once again at the top of the pile, far ahead of the competition. They always do it with defense, and this season is no different; they once again have no defensive holes at any position, with enough size, offense and experience to compete with anyone. Now that they’ve rounded into full strength at just the right time, have McCalebb returning, and with arguably the second deepest roster here behind Barcelona, they are a legitimate contender for the whole thing. I say that knowing full well that the rest of the world has them losing to Olympiakos in the quarter finals. Quietly confident anyway. cross between Benicio Del Toro and David Stern. The Reds shed a lot of payroll last summer, proof that even the richest and most magnanimous of rich guys felt a pinch in the last two calendar years. Linas Kleiza and Josh Childress were allowed (if not encouraged) to return to the NBA, as did Patrick Beverley, and the Big Sofo era finally ended when he moved to Maccabi Tel-Aviv. Nikola Vujcic moved to Turkey (via Croatia), the remnants of Scoonie Penn moved to the Lega Due, and essentially, half of the rotation had been turned over. Of course, they still retooled. As Kleiza went to the Raptors, Rasho Nesterovic came back from there, providing Olympiakos with that rarest of beasts – the big slow unathletic European centre who recognises he still has more to give in the paint than behind the three point line. Rasho averages 11.1 points and 5.6 rebounds in only 21 minutes per game of Euroleague action, having a decent bounce-back season after looking worryingly done last year. (He’s also gotten to the free throw 68 times in 34 games, his highest total since getting there 114 times in 2,353 minutes in 82 games in 2003-04. Less jumpers, more clattering to the basket. Let’s Euroleague.) The other major frontcourt addition was Matt Nielsen, who came fresh from leading Valencia to the Eurocup title. In direct contravention of Rasho’s aforementioned discipline, Nielsen takes every wide open three pointer he is given, and always has done; he is either not cognisant of the fact that he’s not a very good three point shooter, or he’s not bothered by it. The latter seems more likely, as in all ways other than that one, Nielsen is a smart player, able to hit the mid-range shot, finish around the basket, pass well, and defend those as slow as he, while also making an art form out of talking to the refs. Nielsen has struggled at the Euroleague level thus far, due in no small part to his lack of physical tools, yet he has improved as the season has gone along and has significantly cut down his foul rates. Alongside that incoming duo, the incumbent Giannis Bourousis remains, intimidating any opposing guard who dare drive at him, throwing his weight around on the class, rebounding prolifically, making layups, and sticking his threes. Challenge him at your peril. Behind him, former Timberwolves draft pick Loukas Mavrokefalidis provides some smooth, fluid, unspectacular scoring ability, as does 7 footer (and another former NBA draft pick) Andreas Glyniadakis, who has moves, touch, finesse, and absolutely no speed. Marko Keselj was bought from the financially destitute Crvena Zvezda, and serves as the young thin athletic combo forward option, demonstrating a greatly improved jumpshot this season to go along with his athleticism and all the opportunities that having it opens up. And small forward prospect Kostas Papanikolaou is maturing quickly. From being nothing more than a garbage time player last season, Papanikolaou has become a valued and regular contributor to the team, demonstrating good athleticism, rebounding, extra passing, spot-up shooting and occasionally very effective defense, all while making few mistakes for one so experienced being exposed to such a high standard of play. He has certainly been well schooled. To be sure, that’s a lot of depth. 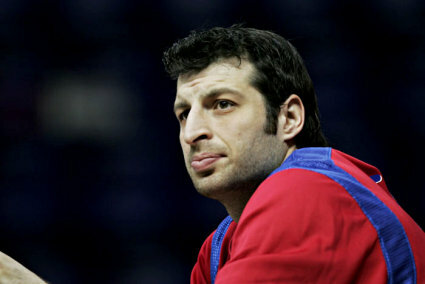 The frontcourt options don’t just stop there, though – additionally, Zoran Erceg – the perennial odd man out, who spent last season on loan at Panionios – has returned to become a regular rotation member for the team, and has scored efficiently on both the interior and the perimeter, although he’s struggling to defend either. And they also returned their former player, Mike Pelekanos, another player who had spent last season on loan, in this instance to Maroussi. Pelekanos barely plays for the team in Euroleague play, and turns 30 in a few weeks, but if called upon, he can still bring athleticism, defense and occasional shooting from the wing position. At guard, Vassilis Spanoulis made the almost unprecedented move across town to Olympiakos from its hated rival Panathinaikos, which no doubt polarised a lot of people. His presence has been a significant addition to the team; it has allowed Milos Teodosic to play mostly in the off-guard role that is more suited to him, and also further reduces the workload on Theo Papaloukas. Papaloukas is as effective in pick-and-roll situations as he as ever been, but he’s also even slower than ever, and has also completely lost his jumpshot this season – split between Euroleague and Greek A1 play, he has shot only 6 for 53 from three point range. He is, by this time, a limited player, who knows what to do, but who doesn’t have the speed to do much of it any more. Also at guard, summer signee Jamon Gordon has thrived in a complimentary role, not relied upon as neither a primary scorer, primary playmaker or primary ballhandler, and just taking what is there – indeed, by thriving in this role, Gordon has further marginalised the role of Yotam Halperin, who spent the whole of last season being similarly marginalised. Halperin is the odd man out in Euroleague play, playing in only 9 contests all season, joining Pelekanos and Halperin on the deepest parts of the bench. Olympiakos downgraded on athleticism this summer – Keselj excepted – yet upgraded on toughness and defense. They are unbeaten in A1 play, and they lost only 4 Euroleague games on their way to this point; rarely if ever could they be accused of wilting. In the other stand-out quarter final matchup, they will take on the aforementioned Siena. Olympiakos have the physical advantage in that matchup – indeed, they have the toughness advantage over everyone. Other than that, however, it’s pretty evenly matched. And it’s a matchup befitting of something bigger than a quarter finals series. This picture would be much funnier if there wasn’t a ball in it. And if they were both in spacesuits. Batiste has now been with the team for eight years, and can pretty much be granted honorary Greek status by now. He started fairly slowly this year, and his 12.9ppg average in Euroleague play trails his 16.9ppg of last season. Nonetheless, he has crescendoed as the season has gone along, and is back to scoring in the more or less unstoppable way he’s practiced now for the best part of a decade. Nicholas, meanwhile, provides the team with a consistent outside shooting threat. Were it not for his presence, the team would lack for such a characteristic, as outside shooting is the one thing at which prized incomer Romain Sato does not excel. Sato drives, posts, defends like crazy, rebounds, and tries to run the court, yet jumpshooting is the weakness in his game. By no means is he a non-shooter, but he is not a natural at it. Drew Nicholas is a natural at it. The problem with building a team around Greek players, as Panathinaikos have done for many years, is there aren’t too many Greek players with enough calibre to play at the very highest levels of Euroleague play. That said, they’ve done pretty well at trying. Dimitris Diamantidis remains, as ever, and with Panathinaikos no longer running a five point guard lineup, Diamantidis is now firmly back playing on the ball. In doing so, he is leading the Euroleague in assists at 5.9 per game, as well as playing his usual brand of defense and shooting 37% from three. Antonis Fotsis is also still there, as inconsistent as ever, capable of shooting, driving, rebounding, posting, passing and playing defense, and also equally capable of playing soft and disappearing for long stretches. The rest of the domestic help also comes in frontcourt players alongside Fotsis; little things specialist Stratos Perperoglu gets big minutes on the wing, defending both forward spots, moving the ball, and shooting 41% from three point range. Fellow national team member Kostas Tsartsaris protects the paint, rebounds, and finishes around the basket, along with sticking the occasional jumpshot. Kostas Kaimakoglou lies somewhere between the two, and boasts a big ginger beard, despite not being a ginger. [What’s the science behind that? How do non-gingers grow ginger beards? As one such genetic freak, I really would like to know.] And Ian Vougioukas, brought in from Panellinios over the summer, will provide post moves, footwork, touch, finishing ability and free throws attempts, whilst also being a complete defensive liability. Without Spanoulis, Panathinaikos no longer have a transition game. They are not as good as they have been in years past; this is particularly evident in the frontcourt, where, even when accounting for the return of Maric, the likes of Tsartsaris, Vougioukas and Kaimikoglou struggle against the continent’s very best. They’re lacking some playmakers who can create off the dribble – Calathes and Nicholas aren’t it – and these problems are compounded by the fact that their quarter final matchup is against Barcelona, which is as hard of a matchup as there can be. That said, there’s still a lot of talent to be found here, and the usual mix of toughness and physical play (Vougioukas excepted) will ensure it is competitive. Sergio Llull on Ricky Rubio. Bizarrely, Real Madrid’s coach Ettore Messina quit the team two weeks ago, after the conclusion of the last 16 stage, pressured to leave after a three game losing streak. That pretty much sums up the culture at Real Madrid – you had better win. Being ranked second in the ACB and making it to the Euroleague quarter finals does not count as sufficient winning. Messina left behind some talent, much of which he brought in. Argentine veteran point guard Pablo Prigioni is still in place, although his skills are starting to slip. As he ages and slows, Prigioni’s famously great defense is fading, and his ability to get to the basket and create his own shot is largely gone too. The current version of Prigioni is thus rather limited; a good outside shooter, good playmaker, pass-first leader point guard with incredibly low turnover numbers, but who is no longer a threat to do much in (or get within) the paint, and who can be exposed by speedy opponents. Behind him, Sergio Rodriguez – in his first season back in Spain after his four years in the NBA – was having a decent season, albeit with rather high turnover numbers and poor outside shooting. However, he has suffered a thigh injury and will miss a month, including the whole quarter finals series. That places a point guard burden on Sergio Llull. And while Llull is awesome – arguably the most athletic non-American guard outside of the USA, with plenty of flair, passing, transition finishes and threes – he is not a point guard, even if he is 6’3. With Rodriguez injured and Prigioni ageing, though, he’s going to now have to be, so maybe the experience will help him grow at the position. At the off-guard position, veteran American guard Clay Tucker. Tucker is a versatile and occasionally dominant scorer, who can drive or shoot, play both on and off the ball, and regularly make an unblockable fadeaway, unblockable due to his combination of size and athleticism. Tucker doesn’t defend nearly as well as this, and has not shot the three pointer as well as usual this season – however, an optimist would say that this means he’s due, and the optimist may well have a point. Starting at small forward, Spanish international Carlos Suarez offers offensive and defensive versatility, with inside scoring, outside scoring, reasonable defense, high IQ play, good passing vision and useful rebounding numbers. This year, he’s spent most of his time spotting up and shooting three pointers, and has done so rather well. And behind them all, Spanish veteran Sergi Vidal has spent the last two years mainly watching on, occasionally chipping in some jumpers, defense and dunks. The mainstay of the frontcourt, Felipe Reyes, is still doing his thing. He’s scoring around the basket, hitting mid range jumpshots, occasionally venturing out slightly further than that, and still rebounding prolifically. As he’s ageing, Reyes is beginning to struggle more defensively, yet he is covered in this regard by the rest of the frontcourt. Real’s centre tandem of Ante Tomic and Mirza Begic stand a combined 14 foot 4 inches tall, ensuring that whenever you drive the lane, someone will be there to block the crap out of you. Begic, a midseason pick-up from Zalgiris (where he had averaged 2.3 blocks per game in only 21 Euroleague minutes per game), does not play much for Real. Yet that does not mean any less of a shotblocking onslaught, for ex-Maccabi big D’Or Fischer is also on hand, turning away 1.6 of his own in less than 20 minutes per contest. While Fischer does not have the height of the other two, he has far more athleticism than them both, and uses it to block shots and rebound prolifically, while also making a few midrange jumpers on offense. The star frontcourt player, though, has been Nikola Mirotic. Not expected to be a big time player for Real, especially aged only 20, Mirotic has demanded a big role on the team based on his superior play. Mirotic contributes in pretty much all facets of the game – shooting, running, rebounding, finishing, driving, defending, even occasionally posting – and does so at all stages of the game, proving to be a vital clutch player in his first full season with this or any team. Mirotic has played so well that Jorge Garbajosa got released, as he was rendered surplus to requirements. Mirotic has played so well that versatile and once highly touted Serbain prospect Novica Velickovic now struggles to get rotation minutes, having to force a fit at small forward just to take the court. Mirotic has played so well that captain Felipe Reyes is also slowly seeing his role become marginalised, to the point that he will inevitably be squeezed out at some point in the next two years, just like Raul was. For all the ex- or future-NBA talent on the team, Mirotic is the one most likely to get there, stay there, and thrive there. And absolutely no one saw any of it coming. Mirotic could well be all three of the best young player, most improved player and most surprising player in the Euroleague this season. And rather than just buying them in, Real Madrid actually developed this one from within. Maybe the Real fans and hierarchy weren’t happy with the Messina era. After all, other than the disgruntled fans of the team who came second, no one remembers who came second, and Real Madrid aren’t the calibre of club that can ever be happy with being an afterthought, which their basketball team has been for too long. But no matter how much of a hand he personally had a hand in it, he leaves behind a team full of a young talent, much of it domestic, with more than enough talent to compete or everything they are in this season, and a great foundation for the future. Things could definitely be worse. A lot, lot worse. Sadly, James Augustine has since shaved this off. Last year’s Eurocup champions returned much of the same team, with a couple of upgrades. Matt Nielsen left for Olympiakos, Kosta Perovic went to Barcelona, shooter Thomas Kelati went to Khimky in Russia, and little used point guard Marko Marinovic left for ALBA Berlin. Yet all were emphatically replaced; Robertas Javtokas left Khimky as Kelati arrived, and took Perovic’s place. Omar Cook joined from Unicaja Malaga, giving Valencia one of the best pure points on the continent, if not the very best. Kelati was replaced by the bigger and more athletic Jeremy Richardson, and Nielsen was replaced by both Dusko Savanovic and James Augustine. And then for good measure, the team also picked up Florent Pietrus during the season. They are now very deep. Logically, it will be Jeremy Richardson who steps into the void vacated by Claver. Richardson has struggled with injuries of his own thus far this season, and was out of favour early, an oft-rumoured candidate for being released. However, he has played much better since returning from injury than he did before suffering it, has won the team back over, and is now being leaned upon to provide the shooting on the wings that no one else really offers. Pietrus is also on hand for an expanded role, providing the athleticism and defense lost with Claver, if not the offensive game. Meanwhile, Augustine’s loss is offset by Savanovic, who is simply the superior player. Savanovic is a hugely talented inside/outside offensive player, with post footwork, passing sense and touch to compensate a strong perimeter jumpshot. Unlike Augustine, and indeed half the team, Savanovic can regularly create his own shot, and is frequently called upon to do so in the Valencia offense. And the rebounding and defensive ends, where Savanovic is less productive (and less interested), are covered by the centre duo of Javtokas and incumbent Sergiy Lischuk, the latter of whom in particular has had a fine season. The two provide the tough aggressive interior defense and shotblocking otherwise lacking on the roster, and in theory, a two centre lineup featuring the two of them will feature at least some of the time in Augustine’s absence. It will be easier to do this if Lischuk can rediscover the three point range he used so often last season (33 makes on the year), and so little in this one (2). Cook’s addition gave Valencia a versatile and talented three guard rotation of him, Rafa Martinez and Nando De Colo. Valencia go only three deep in the backcourt, as opposed to most rival teams; young prospect Jose Simeon is the de facto fourth option, yet he does not play every game, and averages only 7 minutes a contest. (In the event of emergency, Valencia also called up career minor leaguer David Navarro to serve as a last ditched resort open at two guard. But he should not be expected to play.) Valencia might not have a trustworthy fourth option at the guard spots, but they also don’t need one. Cook is one of the finest pure points around, averaging 7.2 points and 5.5 assists in 29 minutes per game, constantly pressuring the defense, looking for seams, and hitting cutters. He is shooting less than 40% for the season, overdribbles at times, and any improvements seen in his jumpshot in the last few years seem to have taken a backwards step this season, but his defense has improved, and his intangibles ever present. Cook’s presence has moved De Colo into more of a combo guard role, and less of a pure point guard one. It’s not working out optimally – De Colo needs the ball in his hands in order to be successful with his isolation scoring, which is harder to do with Cook around, and De Colo’s impact without the ball is limited by his sub 30% three point shooting. Nevertheless, it’s still an incredibly talented duo capable of carving up defense. And there are no such cohesion problems with Martinez, a highly capable all-around player, noted most for tough defense and outside shooting, but also able to make some plays, and get to the rim and finish, despite his relatively small size. Valencia’s season never seems to stop getting better. Rather than simply just making the Euroleague for the second time in their history, they have thrived in it, making it as far as the quarter finals and putting their name in amongst the elite European teams, surviving some roster upheaval and a coaching change along the way. Will the honeymoon end in their quarter final series against Real Madrid? Probably. But there’s no shame in that. All of the 8 teams that are currently competing at the playoffs have their own unique characteristics and competitive level that make them all worthy contenders for a Final Four spot. Also, it makes the race to the Final Four that much more exciting!